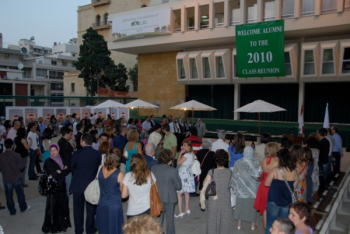 On Thursday and Friday July 15 and 16, 2010 alumni from the classes of ‘05, ‘00, ‘95, ‘90, ‘85, ‘80, ‘75, ‘70, ‘65 and ‘60 were invited back to both the Byblos and Beirut Campuses to celebrate their 5th, 10th, 15th, 20th, 25th, 30th, 35th, 40th, 45th and 50th graduation anniversary with the president of LAU, friends, staff and former professors. A reception was organized for the occasion and alumni received graduation jubilee pins. During both reunions, alumni, their families and friends enjoyed a live outdoor concert by “Chill” jazz band featuring performances by Thomas Hornig (saxophone), Elie Chemaly (bass), Wissam Sawaya (drums), and Alain Oueijan (guitar). Over 400 attendees enjoyed both reunions.